Padmanabhan “Padhu” Seshaiyer grew up in his native India dreaming about how to solve “real world” problems through mathematics. Now, a noted mathematician at George Mason University in Fairfax, VA where he is living out his passion, Padhu is also on a personal mission to change the often-negative perception and image that students have about math. “When I hear a student in middle school, high school or college say ‘I hate math,’ I take it as a personal challenge to change their attitude towards mathematics,” says Padhu, Associate Dean for the College of Science and professor of Mathematical Sciences at George Mason University. At George Mason, he also serves as director of the STEM Accelerator Program in the College of Science and director of COMPLETE (Center for Outreach in Mathematics Professional Learning and Educational Technology). Today, as an applied mathematician, Padhu is living his dream of using mathematics to solve “real world problems in biological, bio-inspired and engineering systems” – thanks to the strong foundation he developed in math as a young student in India. “As a child I was fascinated with mathematics and engineering, and I truly believed I could solve any problem using math,” he recalls. Although the mathematical training he received in India was based strongly on textbook theory and taught by some of the best teachers and mentors available, all which helped him build a solid foundation, Padhu wanted more – specifically how to translate theory into real-world application. It is this insatiable curiosity about how to apply mathematical theory to everyday problems that Padhu encourages teachers to instill in their students. 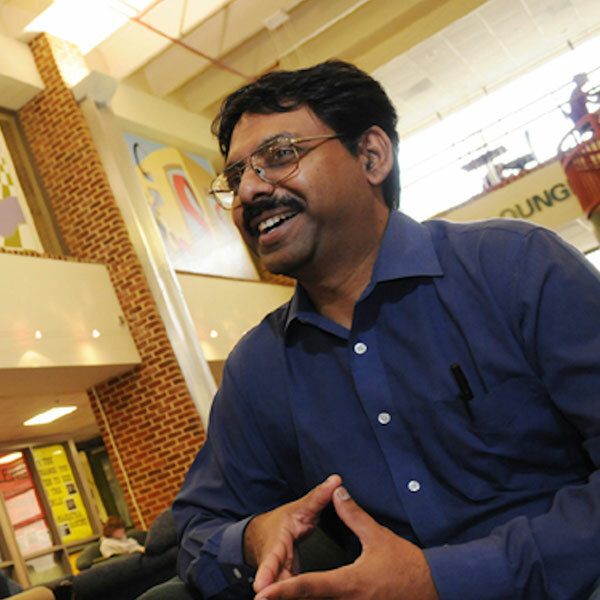 In addition to his laboratory research and teaching endeavors at George Mason University, Padhu also is proud that he is able to transfer his knowledge “back into the broader community –specifically to middle and high school classrooms.“ He does this by being actively involved with area school districts in developing new initiatives and programs that enhance the quality of teachers and introduce students to career options in science and engineering. Padhu received his Bachelors of Science degree (with honors) in Electrical and Electronics Engineering and his Masters degree in Mathematics from Birla Institute of Technology & Science (Pilani, India). He then earned his Ph.D. in Applied Mathematics at the University of Maryland, Baltimore County, and then completed a Biomedical Engineering Program at Texas A&M University as a Post-doctoral Research Associate (“to understand how I could apply my mathematical and science skills to an area that was completely new to me”). He advises students who are contemplating a career in math, science or engineering to: hone their skills in oral and written communication, group dynamics, networking and time management, in addition to keeping abreast of technology within and outside their field.